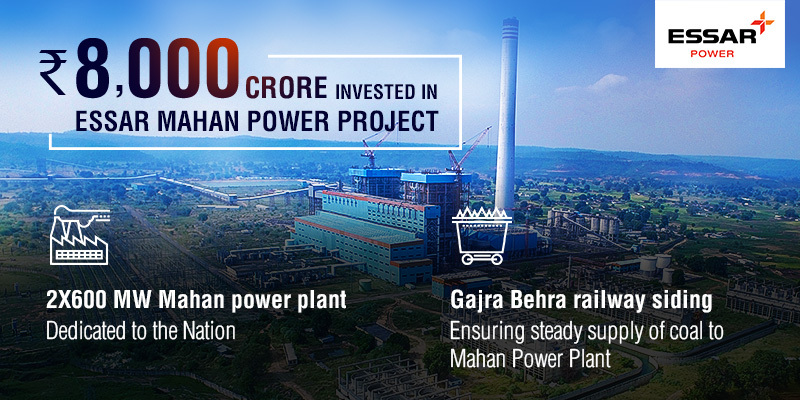 Mahan (Madhya Pradesh) & Mumbai, 10 October 2018: Essar Power today announced the completion of the Rs 8,000-crore capex programme for its 2×600 MW Mahan power plant project with the commissioning of the plant’s second 600 MW unit. Both units of the project are operational and supported by an end-to-end raw material sourcing and evacuation infrastructure. Essar Power Ltd is one of India’s largest private sector power producers with an operating track record of over 20 years. It owns plants in India and Canada with a planned generation capacity of 5,090 MW, of which 3,830 MW is operational. The operating plants are at Mahan in Madhya Pradesh, Hazira & Salaya in Gujarat, Paradeep in Odisha, and Algoma in Ontario, Canada. Another 1,260 MW of capacity is under construction at Tori, Jharkhand, and Paradeep. Essar Power has also invested in the transmission business, building a 465-km transmission system that spans three Indian states.